Liz Thomson, 42, wondered if the "Asia on Argyle" street would need to be taken down as minorities flock from the neighborhood. UPTOWN — At a community meeting to discuss plans for a massive new development on Broadway last week, a neighborhood activist wondered if the well-known "Asia on Argyle" sign advertising the neighborhood's diversity could soon have to change. 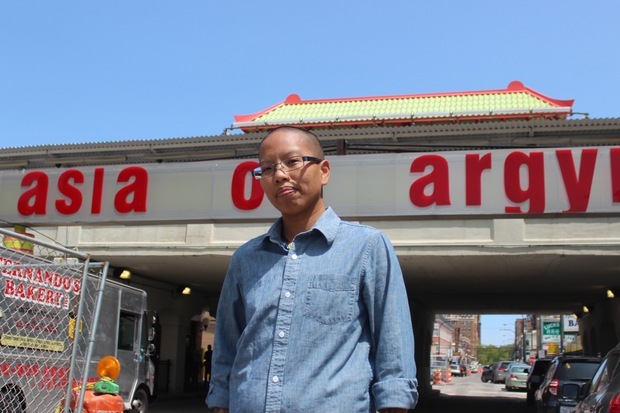 "If the apartment building is built, I would bet my life that in a few years, you'll have to take down the Asian part of Asia on Argyle," said Liz Thomson, 42, a Vietnamese American who left the area for Rogers Park when rents started to climb. "Argyle is where I found my home, my culture, and my community," but developments like the 710-unit project would likely force other residents to leave, too, if rents and property values continue to rise, she said. "The diversity that you believe the new residents will be seeking," she said, will disappear as ethnic minorities are "forced to leave the neighborhood." A DNAinfo analysis of Census data shows that Thomson's fears aren't without merit. Uptown has gotten less diverse in recent years, as affordable housing is razed and property values have jumped. Back in 2000, whites made up about 42 percent of the population, but since then nearly 2,200 whites have moved to the area. Whites now make up about 54 percent of the population, the DNAinfo analysis shows. Josh McGhee goes over the data on the changing demographics of Uptown. Meanwhile, the population of other ethnic groups has plummeted, the data shows. The Hispanic population plunged by 45 percent, a loss of more than 5,700 people, while the Asian population fell by 35 percent, a loss of more than 2,900 residents. The African-American population dropped by 20 percent, or 2,630 people, according to the DNAinfo analysis. The neighborhood is now 21 percent black, 13 percent Hispanic and 10 percent Asian. The demographic changes have put in question Uptown's claim as the most diverse neighborhood in the city — a position it held in 2008, according to a study at the time. "Uptown really is in play right now from a diversity standpoint," said Joseph Schwieterman, who co-authored the DePaul University study, "A Kaleidoscope of Culture: Measuring the Diversity of Chicago's Neighborhoods" with Lauren Fischer. "The most interesting neighborhoods are often battlegrounds between ethnic groups and different income levels," he said. The report named Uptown as the most diverse neighborhood in the city when looking at racial and economic makeup. But the report noted that recent trends were contributing to rapid changes in the neighborhood. Its location near the lake made it prime for gentrification and attractive to investors hoping to buy and sell properties for profit, said Schwieterman, an expert in public policy, urban planning and transportation who is the director of director of DePaul’s Chaddick Institute for Metropolitan Development. "Uptown has a lot of the features young, mobile buyers find attractive," he said. About four months ago, Joshua Dugan and his partner were searching for a home and landed in Uptown because of its access to public transportation and the beach, along with its nightlife, theaters, parks and the architecture, which "is really beautiful." Dugan said Uptown's diversity is "really an attractive part of the area. It feels like everyone is welcome here. It feels like anyone can move here and have a community." Since moving, the 37-year-old attended many development meetings and has voiced his support for those projects. The neighborhood "has too many vacant storefronts" and the developments could increase foot traffic, safety in the area and revenue for the businesses that already exist, he said. "The residential projects are really exciting. [Uptown] needs to be healthier economically," he said. 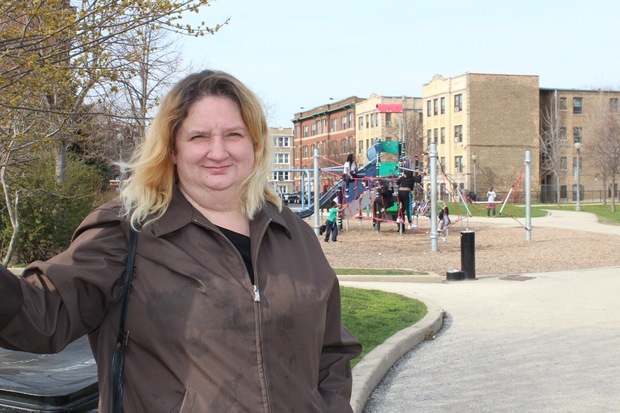 "I am supportive of affordable housing, but I think a lot more of Chicago needs to be supportive. ... I think Uptown does a good job of supporting all these community members." Still, the study warned that the neighborhood needed to do more to maintain its diversity. It said that institutions at the time were struggling to meet the needs of Uptown's "foreign population." And residents have been pushing hard for policies to protect the supply of affordable housing, which are fleeing as investments cater to upper-income groups, the study said. "The problem is these neighborhoods often tip one way or the other. Either they lose the upper income bracket ... or they lose that ethnic factor. Uptown is the latter because of the big development projects," Schwieterman said. For Adelaide Meyers, diversity was something she took pride in while living in Uptown. "When I get on the bus in Uptown, there's people from all over the world and they're peaceful," she said. "I hear about shootings and war on the news, but at Montrose Beach, all the kids are playing together. It's wonderful." She lived at the Norman Hotel at 1325 W. Wilson Ave., an SRO with a variety of short- and long-term tenants. In 2012, that community scattered when Cedar Street bought the property and co-founder Jay Michaels told tenants they had about six months to find new housing, she said. "It really was a good community. People looked out for each other. They were getting their lives together," she said of her fellow SRO tenants. "When Jay bought the property to flip it, the poor people had nowhere to go." After receiving the eviction notices, Meyers, 50, and the other tenants discovered that finding a new affordable spot to live in the neighborhood would not be an easy task. While the developer promised assistance, Cedar Street and BJB Properties were simultaneously buying up other affordable apartment buildings and SROs on the North Side, Meyers said. "Between him and another developer, it was like they were buying up all the SROs in the area. It was really scary," said Meyers, adding the lack of housing opportunities meant other SROs raised rental prices, which meant she would need about $100 more for rent — a difficult task for someone suffering from schizophrenia and dependent on Social Security. Ald. James Cappleman (46th) said he is well aware of the changes taking place in Uptown. Cappleman's 2013 Ward Master Plan highlighted the neighborhood's diversity as highlighted in Schwieterman's study. He has repeatedly echoed the ward's commitment to diversity also cited in that plan. "We're doing everything we can to keep that diversity and part of that is affordable housing," Cappleman told DNAinfo in April. Cappleman said he has tried to get developers of affordable housing to buy SROs. But "the problem we have is a number of SROs are in terrible condition." The Norman Hotel and Lawrence House both filed for bankruptcy and had hundreds of building code violations, making them undesirable to affordable housing developers, he said. "It becomes a [snowball] effect to keep the upkeep up," he said. Cappleman maintained the decline in African-Americans and increase in white population is similar to trends in other parts of the city. Schwieterman said that redevelopment and higher rents can make it difficult for homegrown ethnic businesses to stay in the neighborhood. As the businesses disappear the population follows, Schwieterman said. "Latinos are often in the line of fire when there's gentrification. They often struggle with a severely tight budget" so even a moderate increase in rent can be disastrous, he said. In 2013, the city spent $260,000 of TIF funds for the Asia on Argyle sign, the first step in a revamp of a project 15 years in the making. In July 2015, Osterman (48th) launched the Argyle Streetscape, a $3 million project to transform Argyle Street from Broadway to Sheridan Road into a shared street. Though the Argyle Streetscape is scheduled to be completed this summer, the Cedar Street Project, which will bring 710 units to Broadway, was approved by Osterman last week. The project would be completed in two phases over the next 2-3 years. While Chinatown might be able to withstand changes, "smaller pockets of Asian population are often dissipating as development approaches," Schwieterman said. "All the trends show Uptown becoming less diverse. ... It's less likely to be the first stop for an immigrant like it was a decade ago." While Mark Heffron, the managing director of Cedar Streets, said the company could not discuss any topics related to race because of the Fair Housing Act, he did defend the developer's efforts to help move residents after buying out low-income buildings like Meyer's building. The company paid security deposits and sometimes physically moved residents into other properties, he said. "We took the opposite approach" of other developers, he said. "Anyone willing to talk to us received assistance." The Norman Hotel is now home to rehabbed studio, one-bedroom and two-bedroom apartments with rents starting at about $850 as FLATS No. 1350. Its 121 apartments have all been rented since it opened 1½ years ago. Thirteen of those units are low income, he said. "We had zero requirement to do any affordable units, but we still decided to partner with the city of Chicago and the program has been a huge success," he said. After the eviction, Meyers was able to double-up with another tenant of the Norman Hotel in an apartment in Rogers Park. Census data shows the neighborhood is now the most diverse with a roughly even spread of about one-third white, one-third black and one-third Hispanic. She said her health and quality of life has improved since moving, she said. "It's expensive and we don't have extra money, but we have a nice apartment," said Meyers. She will graduate from college in November. "I'm excited about that. Things are going pretty good for me right now."